You can select up to 9 travellers in total. Combine stunning Italian scenery with one of the country’s most fascinating historical sites on this private day trip from Rome to Positano and Pompeii with your own transport and driver. You’ll start with the UNESCO World Heritage–listed archaeological site of Pompeii for an exploration of its volcanic ruins. 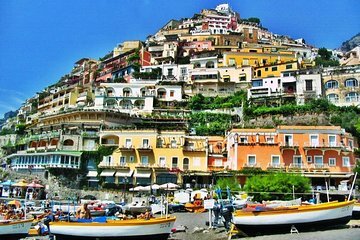 Then hit the Amalfi Coast to visit the seaside village of Positano, where you are free to enjoy its charms on your own. When booking, you have the option to include a guided tour of Pompeii; otherwise, you’ll explore the ruins independently. After pickup at your Rome hotel by your professional driver, hop into your private minivan to start your day trip, which takes you south of the city into the Southern Italy region of Campania. During the approximate 3-hour drive to your first stop, catch a glimpse of the Abbey of Montecassino, a hilltop monastery. When you arrive in Pompeii, pay your own entrance fee before heading inside, where you have about two hours to take in the archaeological ruins of this World Heritage site. Learn about the eruption of Mt Vesuvius in 79 AD that covered the ancient Roman city in ash and molten pumice, freezing the village in time. Depending on the option selected when booking, you’ll either explore the well-preserved streets on your own or take a tour with a knowledgeable guide who tells you about the Forum, thermal baths and other village features that were part of daily life for Pompeii residents. Then continue your day trip along the winding Amalfi Coast to your final stop, Positano. Here, you have more free time to admire the pastel-colored houses that perch on the cliffs, shop in high-end boutiques, enjoy a drink or meal at a local eatery or take a walk on the beach. When your time is up, hop back in your minivan for the return drive to Rome for hotel drop-off. Please note: If you prefer, the visit to Positano can be replaced with a visit to Sorrento. Coordinate before you travel with the local supplier; contact details are shown on your booking voucher. This was one of the highlights of our trip! Matteo, our driver, was incredible. Prompt, personable and helped customize the day for us based on our interests. Ida, our Pompeii tour guide helped bring the experience to life for our kids. I highly recommend this day trip from Rome! Three of us booked private transportation and a private tour guide to visit Pompeii and see the coast south of Naples in one enjoyable day excursion from Rome. The driver, Davide, was prompt and professional. Our tour guide in Pompeii, Santiago, was equally professional, extremely knowledgeable and allowed us to set the pace to tour Pompeii. Since we opted to spend more time exploring the excavations of Pompeii, our driver discussed our options for touring Positano. We decided, with his input, to pass on Positano, and visit Sorrento. The old town pedestrian area was touristy, but Davide provided us with tips where to eat, and advised we walk down to the beach. I'm glad we walked to the beach to soak in some sun. I can't imagine touring Pompeii and the Naples-Amalfi coast during peak summer tourist season. Going off-season on a sunny day was a perfect day trip from Rome. This was a long day but we thought it was worth it. Our driver in Rome Alan was on time, pleasant, open to answering questions about the country, knowledgable, very patient as we hit unexpected traffic and the day ran long. He was delightful. Our tour guide Ida in Pompeii was amazing... also kind, pleasant and knowledgable. Great tour. Best experience from Rome especially if you have a limited amount of time to see Italy. Driver was very nice and informative and took us to very nice places along the coast. Pompeii is a must see too! A wonderful day with our driver Georgeio who provided us with lots of entertaining, informative conversation! Our guide in Pompeii was Barbara who was also extremely knowledgable. We certainly couldn't have had a better day trip! Highly recommend this tour. Our guide and driver Matteo was excellent. He promptly picked us up from our hotel in a very comfortable air conditioned van. He was very accommodating to our comfort and needs and gave us great information about places we visited. Pompeii is amazing and like looking at history frozen in time. Positano is just beautiful. We had a delicious lunch at a restaurant Matteo recommended with incredible views. We had a great time and would recommend this tour to anyone without hesitation. Damiano was an excellent guide! He highlighted spots along the way that were of interest and was very patient with our questions. He was quick to make great suggestions and was thorough with his explanations. If I had time to book another tour in Rome, I'd ask for Damiano to be our guide. Thanks for an amazing experience!! The day tour to Pompeii and Positano was fantastic. Choosing the option of a private mini van we had a group of eight people was an excellent idea and it made our day so flexible. Our driver, Marco, was knowledgeable and very friendly. He made sure we were always comfortable and never once did he rush us through the day. I would repeat this tour again without hesitation.